Venue: Magdalene College, Cambridge, UK. MAGDALENE COLLEGE, CAMBRIDGE is fortunate to have among the holdings of its historic Old Library the papers and prints of the Ferrar family of Little Gidding. These came to the College in the late eighteenth century, through the generosity of Martha Ferrar, who was married to the liberal theologian Dr Peter Peckard, Master of Magdalene. Important witnesses to the histories of transatlantic trade, of seventeenth-century Anglicanism, and of the development of metaphysical poetry, the records of the Ferrar family provide a wealth of evidence for historians, literary scholars and theologians. THIS CONFERENCE WILL LOOK at the influence of the family from their involvement with the Virginia company, to the family’s relationship with George Herbert and the planned construction of a Harmony of the Gospels; and the conference coincides with the completion of a major project to conserve the 600 Ferrar prints (collected by the family from the late sixteenth-century) at Magdalene College Cambridge. 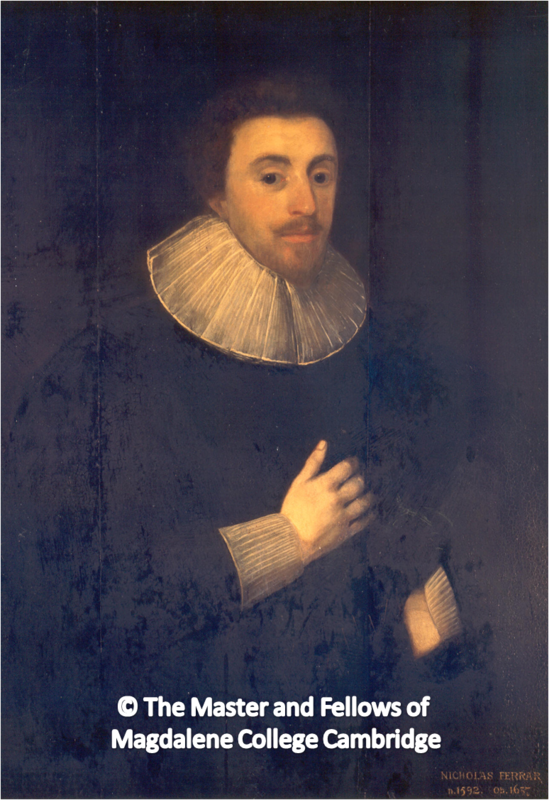 THEMES for papers might include: transatlantic trade,The Virginia Company, the role of art in lay piety, the Ferrar music collection, prints and family papers at Magdalene, the literary influence of the Ferrar family, the community at Little Gidding, seventeenth-century Anglicanism. THE REGISTRATION FORM is available here (PDF) Ferrar conference (REGISTRATION) or email litfest@magd.cam.ac.uk for other formats. Registration will close on or before 1st April 2016. There are limited places and please note that registration will close when the conference is full. Proposals for papers on the topic of the Conference are invited. The deadline is 1st December 2015 and the programme will be confirmed with prospective speakers in January 2016. The Proposal should be about 200-500 words long, and it is helpful if prospective speakers indicate any audio-visual requirements. Papers at the conference should be between 15 and 20 minutes long. The conference advisory group is: Dr M E J Hughes (Chair), The Master of Magdalene Dr R Williams, Professor E Duffy, Professor H Cooper, Professor J Raven, Dr G Atkins, Dr M Hetherington., Miss C Sutherland. Reblogged this on Magdalene College Libraries.